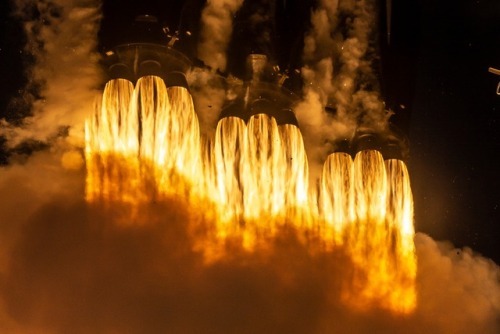 Explanation: Twenty seven Merlin rocket engines are firing in this close-up of the launch of a Falcon Heavy rocket. Derived from three Falcon 9 first stage rockets with nine Merlin rocket engines each, the Falcon Heavy left NASA’s Kennedy Space Center launch pad 39A on April 11. This second launch of a Falcon Heavy rocket carried the Arabsat 6A communications satellite to space. In February of 2018, the first Falcon Heavy launch carried Starman and a Tesla Roadster. Designed to be reusable, both booster stages and the central core returned safely to planet Earth, the boosters to Cape Canaveral Air Force Station landing zones. The core stage landed off shore on autonomous spaceport drone ship Of Course I Still Love You.